The Beta is now available for the next release of Vault. There are some nice new API features that you will want to take a look at, but I can't talk about them here. Sign up for the Beta, and let's chat about it on the Beta forums. My Getting Started with Autodesk Vault Programming videos are now live on AU Virtual. If you have an AU pass, you can now watch these videos on the AU website. If not, you can sign up to AU Virtual for free. There is 90 minutes of content, spread across two 45-minute videos. The videos contain not 1, not 2, not even 3, but 4 complete programming demonstrations! 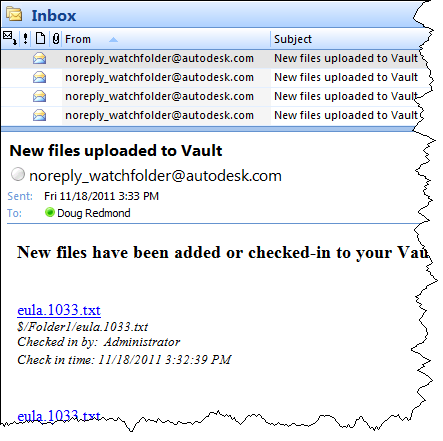 Each demonstration illustrates a different aspect of the Vault API. I start with a new Visual Studio project and go through all the steps in writing, deploying and running the application. You can even follow along in your own development environment if you want. For the AU event itself, I have a lecture class which will be a deep dive into the events feature in the 2012 API. 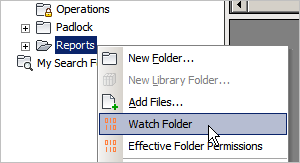 Update: Watch Folder 2013 is now available. Looking for that perfect gift to give this year? Why not give the gift of Watch Folder?! I just updated it to work with Vault 2012, and I added in support for HTML style emails. Click here for the 2.0.3.0 hotfix - Applies only to the Job Processor component. For Vault administrators, download the application and run the installer. Next follow the instructions in the readme file in the install folder (%ProgramData%\Autodesk\Vault 2012\Extensions\WatchFolderCommand). The admin install is still a lot of steps. I did a bit of consolidation, the Job Processor plug-in and the Vault Explorer plug-in have been combined. All the settings files from R1 can still be used, just copy over WatchCollection.xml, WatchSettings.xml and WatchEmailBody.txt over to the install folder. 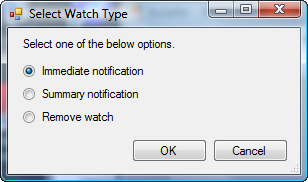 I recommend updating WatchSettings to use an HTML file instead of a text file. There are more formatting options and you can have hyperlinks. More file informaiton can be provided in the email. See readme for more details. Many people have noticed that with Web Service Command Events, there is no way to tell the name of the Vault you are connected to. You can get a context to make API calls, but the Vault name is not part of the context. It's a limitation of the architecture. So here is my suggested workaround: Create a Vault Option called "VaultName" and store the name there. That way, your code can call KnowledgeVaultService﻿.GetVaultOption("VaultName") to get the Vault name. Of course, the option has to be set up ahead of time, like during the install or the initial configuration of your app. PS. Sorry for the short article. I'm busy finishing up the materials for my AU class on events. If you ever come across errors 1092, 1387, or 1633, you need to look at the restriction codes to figure out what the problems are. Basically these codes are telling you, "We can't fully describe the problem with a single error code so we provided extra information." Error codes are limited by the fact that there can be only one of them when something goes wrong. For cases where multiple things go wrong, extra data is contained in the restriction codes. This mechanism comes in handy when an operation is being done on multiple objects at once or multiple things can go wrong. That way everything can be presented to the user at once instead of making them fix things one at a time. As a programmer, you probably just want some code that you can copy and paste into your project. So here you go. As always, I'm eager to please. If the Exception is coming from the vault server, the following function will return both the Vault server error code and any restriction codes.